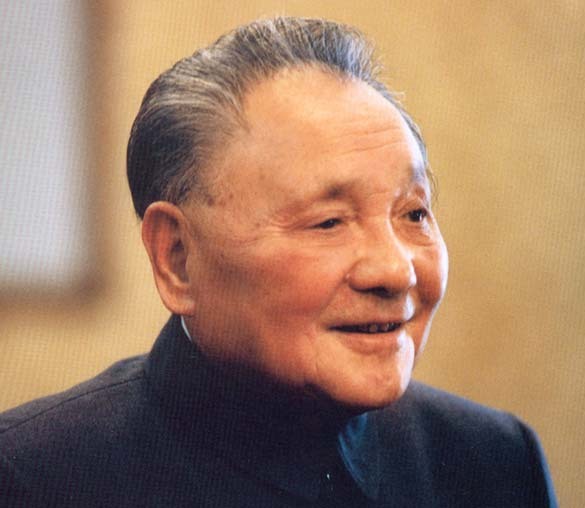 Editor's Notes: In January 1992 at the crucial juncture of China's reform and opening up program, Comrade Deng Xiaoping paid an inspection tour to south China where he delivered a series of speeches aimed to clarify the muddled idea about whether the establishment of special economic zones is of "capitalism" or socialism" in nature. People within the Party generally learned about this from a document of the CPC Central Committee, while the majority of Chinese common people knew this from a news report entitled "Vigor of Spring Greets the Eyes as the East Wind Comes" relayed from newspapers and magazines nationwide. This report indeed triggered a strong repercussion nationwide. We once again present this news report to all of you, so that we together cherish the memory of Deng Xiaoping, the chief architect of China's reform and opening up program. It was near the traditional Chinese Spring Festival that our respected and beloved Comrade Deng Xiaoping came to Shenzhen! In the crucial period of China's socialist modernization drive, the arrival of Comrade Xiaoping was the greatest concern and support for the Shenzhen Special Economic Zone, as well as the greatest encouragement and spur to the Shenzhen people. At around 8:00 a.m. January 19, on the Shenzhen railway platform, several provincial and city leading members and a crowd of other people were waiting for Deng's arrival with great excitement. He's come! Then there came the rumbling sound from afar, followed by a long train which stopped by the railway platform at 9 sharp in the morning. Before long, Comrade Deng Xiaoping made his appearance! People's eyes and the flashlight immediately turned to this great man. He looked very healthy, with a pair of bright, piercing eyes, a kindly, smiling face, wearing a dark gray jacket and black Western-style trousers. Glowing with health and vigor, he walked out of the car. After an interval of eight years, he once again stepped onto Shenzhen, a piece of land in the forefront of reform and opening up. After alighting from the car, the smiling Deng shook hands with Xie Fei, secretary of the Guangdong provincial Party committee; Li Hao, secretary of the Shenzhen city Party committee and Mayor Zheng Liangyu, who had come there to welcome the leader. Comrade Deng Xiaoping, together with the provincial and municipal leading members got on board a mid-sized bus which steered direct to the guest house. Considering that Deng had traveled a long journey, the city responsible member persuaded the grand old man to take a good rest. However, Comrade Xiaoping showed not the least fatigue. He said, "Now I've come to Shenzhen, I want to have a look everywhere." It is widely known that Comrade Deng Xiaoping was the principal decision-maker of the establishment of special economic zones. As early as April 1979, after listening to the reports given by the main leader of the Guangdong provincial Party committee, Deng said: We can mark out a piece of land and call it a special zone, like the case of the Shaanxi-Gansu-Ningxia Special Zone. The central government had no money, and you should do this by relying on your own resources. In August the following year, the National People's Congress formally adopted and promulgated the "Regulations on Guangdong Provincial Special Economic Zones, thus heralding the birth of China's special economic zones. The Shenzhen Special Economic Zone is one of the earliest experimental areas for reform and opening up. Comrade Xiaoping showed great concern about its development. In January 1984, he went to Shenzhen on an inspection tour. Eight years had elapsed. What changes had taken place in the face of Shenzhen? This grand old man was eager to have a look at it by himself. On January 26, 1984, Comrade Xiaoping wrote the inscriptions for the Shenzhen Special Economic Zone, which read, "The development and experiences of Shenzhen have proved the correctness of our policy on the establishment of special economic zones." In 1984, construction of the special economic zone encountered a lot of difficulties and resistance, some people adopted a wait-and-see attitude toward the establishment of special economic zones. Deng's inscriptions meant decisive support to the construction of the special zone, reinforced people's determination and confidence in the special zone, and gave a push to the further advancement of the construction of the special zone. Accompanied by provincial and city responsible leading members, Comrade Xiaoping had a sight-seeing in the city. In the previous eight years, here was still a place with paddy fields, fish- ponds, small paths and low houses. Now in 1992, this place was crisscrossed by wide roads, a block of high-rises towering into the sky and full of a of modernization flavor. Deng was very happy to see such a prospering and vigorous scene. Just as he said later, "eight years have passed, this time I come to see that Shenzhen, Zhuhai and some other localities have undergone rapid development, it is really out of my expectations. After seeing all this, I've got enhanced confidence." While having a sight-seeing in the city, Comrade Xiaoping talked cordially with the provincial and municipal responsible members. While speaking about the establishment of special economic zones, Xiaoping said: From the very outset there were different opinions concerning the establishment of special economic zones, fearing whether this meant practicing capitalism. Shenzhen's construction achievements have answered those having worries of one kind or another, the special zone is "socialist", not "capitalist" in nature. Judged from the situation in Shenzhen, public ownership is the mainstay, foreign investment accounts for only one-fourth. Take that part of foreign capital for example, we can benefit from taxation and labor service! Don't be afraid the establishment of more Sino-foreign cooperative enterprises, Sino-foreign joint ventures and solely foreign-owned businesses. We need not be afraid so long as we are clear-headed. We have advantages, large and medium-sized State-owned enterprises and township enterprises, more importantly, we have the political power in our own hands. Speaking of the question regarding economic development, Comrade Xiaoping said: the "four small dragons" (Hong Kong, Taiwan, Singapore and South Korea) in Asia have developed very rapidly, so has your development. Guangdong should strive to catch up with the said "four small dragons" in Asia in a 20-years' time. After a while, he added not only should we push up the economy, we should also create a good social order and a good social mood. We should surpass them in material development and cultural and ethical progress, this and this alone can be regarded as socialism with Chinese characteristics. Singaporean social order is good, because the country put it under strict control, we should learn from its experiences and should exercise better management of society.